Black Shape and Sculpt Dress is rated 4.2 out of 5 by 14. This flattering shape offers both style and class, with hidden built-in control to help flatten your tummy and hold you in. With cut-out front detailing along with a flattering length and sleeve, this bodycon dress will create the perfect silhouette, reducing inches from the waist through the full body control panel that smooths the stomach. 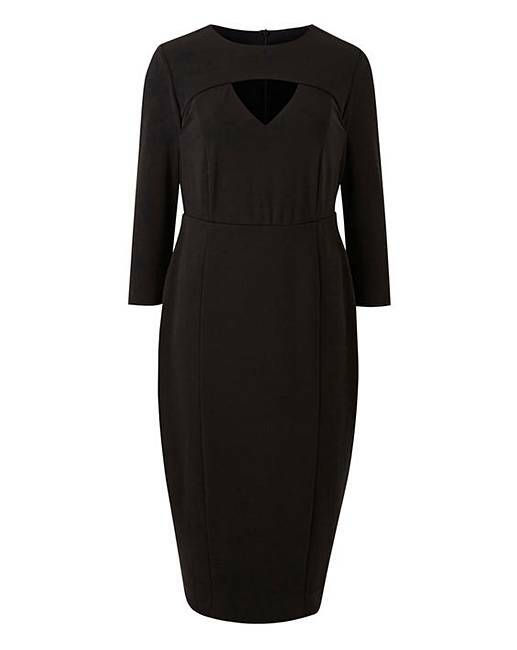 Perfect with a pop of colour on your shoes and accessories, this shape and sculpt dress can be worn for a variety of occasions with its timeless cut. 95% Polyester, 5% Elastane. Lining: 80% Polyamide, 20% Elastane. Rated 2 out of 5 by gailygoogoo from Small fit I did not like this dress at all. The material was really heavy and it was a very small fit. Looked great on the model but not so great on me. Rated 2 out of 5 by Jools from Odd Shape Fabric was thick & of quite good quality. However, it was an odd shape over the hips with too much fabric, giving an ear effect from the top of the hip to the top of the thigh. The neckline was a little uncomfortable. The dress is cut for a slimmer top, but larger hipped girl. Rated 5 out of 5 by Sassy from I bought this on impulse. Yes bought this on impulse after seeing it in advert. Glad I did, Lovley dress and perfect fit. The sleeves are great when you get to that age. Will put photos on later. Rated 5 out of 5 by alison24 from Little black dress I bought this as a treat for myself for Christmas.